It’s those first chilly days of March and spring may be just a few days around the corner. That is the rumor anyway, started by 2019 gossip after that spunky groundhog, Punxsutawney Phil did not see his shadow predicting an early end to this crazy winter. As I take my dog for a rain-soaked and kind of snowy at times trek on this late winters morning I have to wonder if Pennsylvania’s favorite groundhog is spewing fake news. 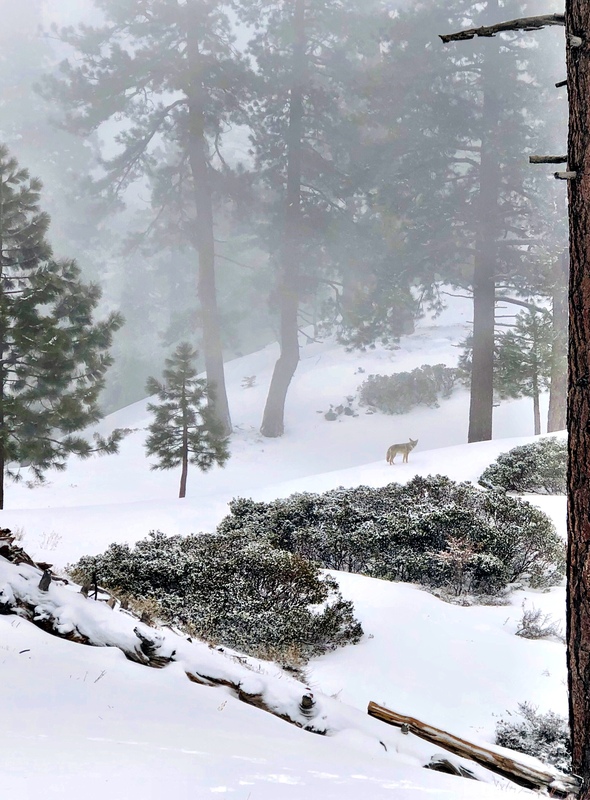 As of March 3rd, it certainly does not feel like spring has sprung here in our alpine village of Big Bear Lake as my pup and I hike up and down snowy hills running into wild coyotes, and baby donkeys in the backcountry. Like all of my neighbors here in our rural mountain town, I’m dying to put away my snow shovel, trading it in for my gardening gloves. So what do you do with these last few snowy weeks in our winter wonderland? Well, you could take your cat for a walk on a leash. Snowshoeing, yes sometimes literally in our backyard, if your neighborhood backs up to the forest as ours does, could be the answer! Snowshoeing is the best outdoor winter exercise and is a lot cheaper of a hobby then skiing or snowboarding. 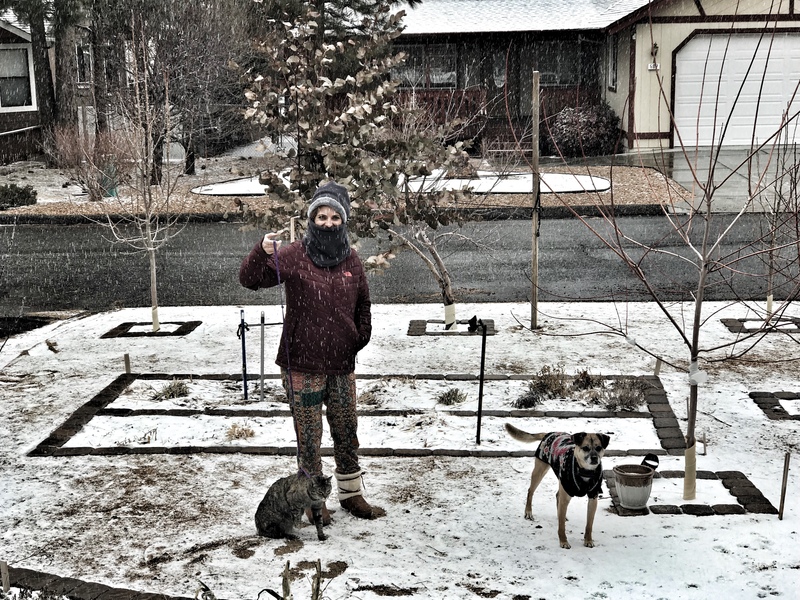 (And you have less of a chance of getting hurt for the accident-prone, like me) Goldsmith’s in Big Bear rents snowshoes for around 20 dollars giving you a whole day of snowy outdoor good times! As an avid snowshoer, I personally know there are a lot of misconceptions about snowshoes. No, I do not wear tennis rackets on my feet. Snowshoes are a lightweight frame that enables you to be able to walk on the snow without sinking in too far. The snowshoes are held onto your snow boots with bindings that you tighten so they stay on your boots. Snowshoers like to say, “If you can walk you can snowshoe” Snowshoeing can be an easy form of aerobic exercise or as hard as you want it to be. If you can find a flat area to snowshoe then it’s pretty easy. Of course, in our mountain communities finding a flat area for beginners snowshoeing is the hard part. Looking to try snowshoeing for dummies? My best advice for the first time you strap snowshoes on over your snowboots is to try snowshoeing across Baldwin Lake when there is enough snow. It’s super flat and easy. Looking for a harder snowshoe adventure? My dog and I love snowshoeing adventures up Van Dusen Canyon Road or Polique Canyon Road. Either will take you back to Holcomb Valley, which is a gorgeous alpine wonderland in the winter. Looking for an advanced snowshoe to really get you sweating. 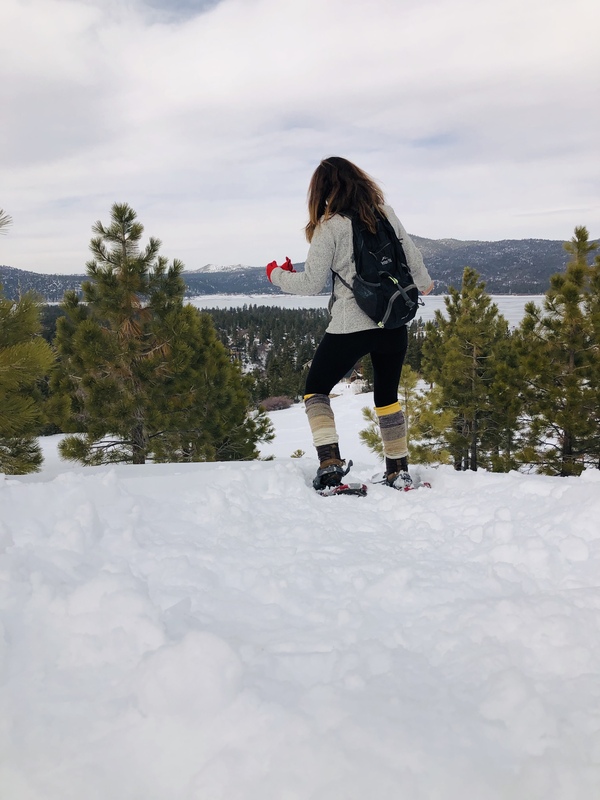 Try snowshoeing up Pine Knot Trail in Big Bear Lake. 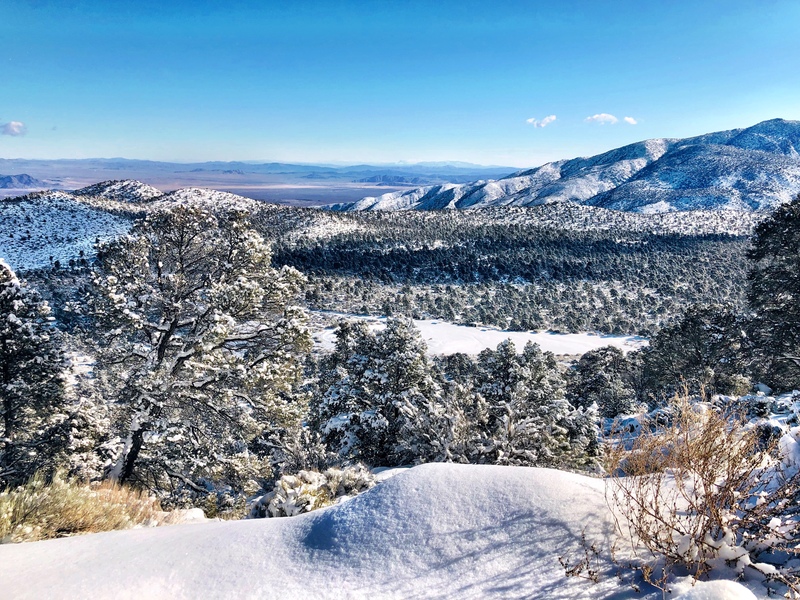 This takes at least three hours to complete the whole trail to the epic views at Grandview Point but this seven-mile snowshoe adventure is worth of the views over Highway 38 in the distance and San Gorgonio to the southeast. If you are not quite in Big Bear, I’ve spent many a morning at Rim Nordic’s cross country ski area. It’s a great place to snowshoe and is relatively flat for about a mile as you snowshoe through the pine forest. Some important reminders for a day out snowshoeing; Always wear layers and bring lots of water. Snowshoeing is a bit tougher then hiking so you will make less mileage as you trek into the forest and back. Hiking poles will help you keep your balance and I highly recommend renting them to help you on your day out with the snowshoes. I always, always leave my GPS, Strava or MapMyRun running on my phone when snowshoeing a new area, just in case, to help me not lose my way back to the nice warm car. So what are you waiting for? 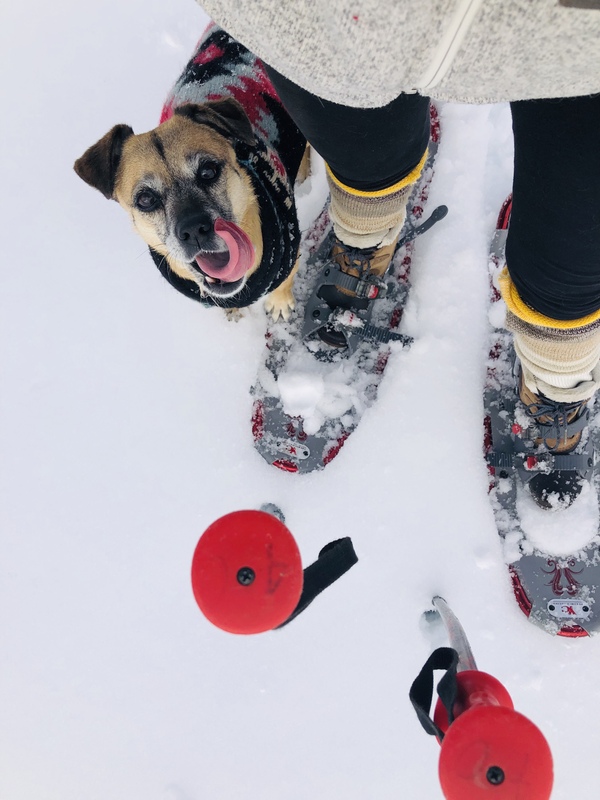 As much as we want a sunny spring day, the trails are still covered in fresh powder, enjoy these last few weeks of winter by hitting the local trails with snowshoes! This week I’m linking up once again with the following blog hops. I love Big Bear, but I save my visits for the summer! Knowing me I’d probably turn my ankle snowshoeing. 🙂 It may be a long cold winter but it sure is beautiful up there! I’ve never been snowshoeing, but as someone who really does not like skiing, this sounds like it might be more my speed. Also, you live in a very picturesque part of the world!